Group photo of all participants (except Peter Tyack and Constance Scharff, who had to leave early) contributing to a Lorentz Workshop on Musicality in April 2014. For me personally, it was simply a pivotal workshop. With over twenty international scientists and scholars (i.e. Judith Becker, Simon E. Fisher, Tecumseh Fitch, Bruno Gingras, Jessica Grahn, Yuko Hattori, Marisa Hoeschele, David Huron, Yukiko Kikuchi, Hugo Merchant, Bjorn Merker, Iain Morley, Ani Patel, Isabelle Peretz, Martin Rohrmeier, Constance Scharff, Carel ten Cate, Laurel Trainor, Sandra Trehub, Peter Tyack, Geraint Wiggins and Jelle Zuidema) interested in musicality, we succeeded in agreeing on a research agenda to study what makes us musical animals. A publication is expected to be out in 2015. But for now, I can only be exhilarated that this group of fine researchers share a sincere fascination for this topic. A photo impression of the workshop can be found here. 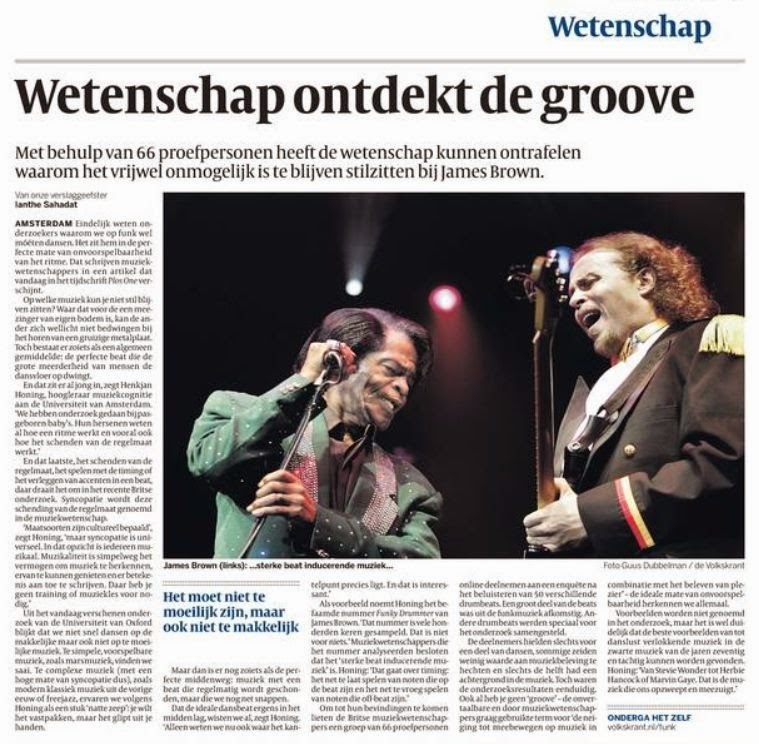 Today PLOS ONE will publish an interesting study on rhythm, groove and syncopation that uses an often criticized methodology: questionnaire and web-based research (cf. Honing & Reips, 2008). However, this study is a good example of how an unspectacular method (compared to brain imaging techniques, elegantly controlled experiments or advanced computational modelling) can still be quite informative. The paper takes advantage of people's intrinsic interest in rhythm, timing and what's often called 'groove', in combination with the sheer fun of participating in an online listening experiment that has to do with music (cf. Honing & Ladinig, 2008). Based on sixty-six responses, the authors were able to extract an inverted U-curve for a music-theoretic measure of syncopation, a shape that was absent for an alternative, information-theoretic measure based on the acoustic quality of the soundexamples used (i.e. entropy). As such the study provides evidence that the theoretical notion of syncopation, as defined by Longuet-Higgins' L-model in the 1980s, might be an important component of 'groovyness': pleasure and dance-inducing aspects of many musics ranging from James Brown to Marvin Gay and from Funkadelic to Stevie Wonder. The first author, Maria Witek (Aarhus University), encouraged me to mention that the questionnaire and all soundexamples are online. Feel free to take part. Honing, H., & Ladinig, O. (2008). The potential of the Internet for music perception research: A comment on lab-based versus Web-based studies. Empirical Musicology Review, 3 (1), 4-7. 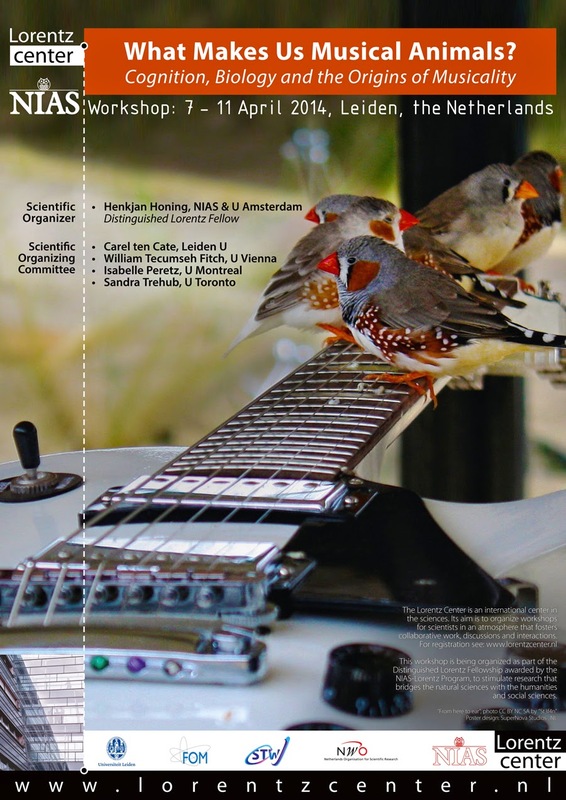 The question that will be central in an (invitation-only) workshop that starts next week, will be: What makes us musical animals? The meeting, that is co-organised with Carel ten Cate (Leiden U), Tecumseh Fitch (U Vienna), Isabelle Peretz (U Montréal), and Sandra Trehub (U Toronto), took quite some of my attention in the weeks leading up to it and hence didn't write blog entries for a while... However, if you want to read some exiting new stuff see the references below. These are just a few examples of many recent papers that address what could be the basic components of musicality. More later.